Sporty and solid, the BMW 1 Series is a premium car with something to impress everyone. Its stylish and sculpted exterior really makes a statement, and its rear-wheel drive set-up is more akin to a powerful sports car than an everyday hatchback. Yet with a spacious interior and dynamic emission-reducing technology, it’s undeniably a family-friendly vehicle. Browse our BMW 1 Series finance cars or chat online with our dedicated experts to see how you could save on a BMW lease car with AMT Leasing. Why lease the BMW 1 Series? There’s a huge range of choice in the sports hatchback arena from almost every manufacturer, but the BMW 1 Series is the only model that offers unique rear-wheel drive. With a whopping five specification levels, a range of 3 and 5-door models and the choice of both petrol and diesel engines, there’s bound to be a BMW that suits you. The SE has an excellent selection of innovative features that come as standard, while the M Sport Shadow Edition is perfect for those looking for sophisticated style. For maximum driving pleasure, it has to be the top of the range M140i. If you’re looking for unparalleled performance, you can pretty much take your pick. Choose between the standard 3-cylinder motor, 118d or 120i four-cylinder engines or the monstrous M140i to pack a stunning six-cylinder petrol engine beneath the bonnet. For an ideal combination of performance and efficiency, look no further than the 116d Efficient Dynamics. Designed specifically to optimise driving pleasure whilst reducing fuel consumption and minimising C02 emissions, this feature is a masterpiece of construction, aerodynamics and engine efficiency. 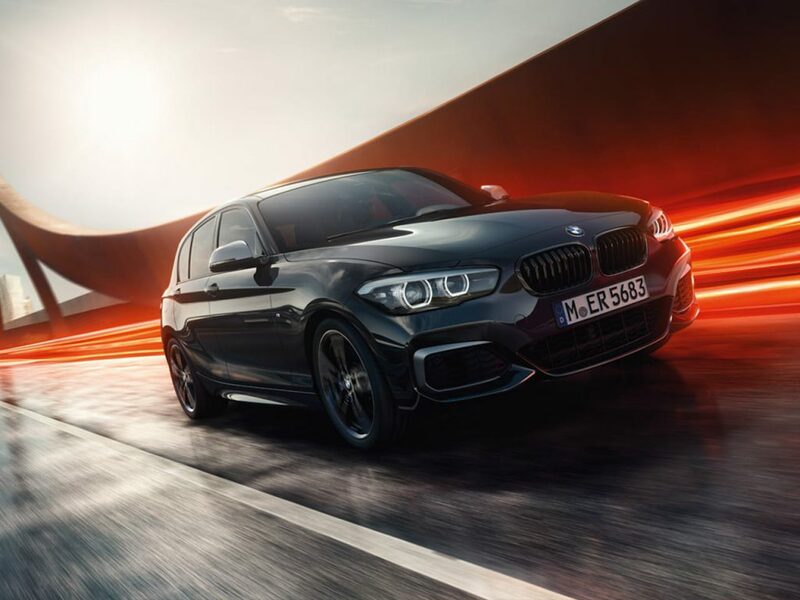 Every model of the BMW 1 Series emphasizes performance and handling, with M Suspension and TwinPower turbo options ensuring an even greater driving experience. All versions also feature stop-start technology as standard. You can’t miss the L-shaped LED tail-light cluster and the sharp redesign to the creases, both giving the car a solid look to match its drive. The classic BMW grille is front and centre on every model, as well as alloy wheels. The Sports models get bigger wheels and better seats, while even at SE level you get front fog lights, air conditioning, rain sensor and automatic headlights as standard. The BMW 1 Series puts you in control with variable driving modes, including Comfort, Sport, Sport + and Eco. The 5-star iDrive system allows you to select your multimedia set up on a 6.5 inch display, which can be upgraded to 8.5 inches if required. Enjoy one of the most user-friendly interfaces of any infotainment system, with shortcut buttons and a large control wheel right next to the gearstick. The infotainment menus are quick and easy to navigate, so you can stream music from your phone or catch up with the latest traffic updates from the sat nav in no time. The leather-trimmed steering wheel completes a fabulously equipped interior, along with a fully adjustable driver’s sear and variable steering wheel positions. With two Isofix points in the back seats and an increased boot space compared to previous models, families are well catered for. The generous level of standard safety features include four airbags and a five-star Euro NCAP rating, making for a solid and reliable family car. At AMT Leasing, we offer a range of BMW cars to lease as well as the 1 Series. Simply chat with our leasing experts online or browse the comprehensive range today to find a BMW finance deal that suits you. If there isn’t a model in the BMW 1 Series that meets your needs, why not consider an Audi A3 or a Mercedes-Benz C Class.